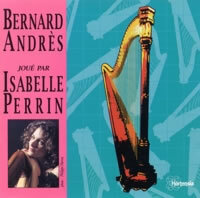 In this excellent CD Isabelle Perrin performs music of contemporary French harp composer Bernard Andrès. Andrès composes in a very wide range of styles, moving in this CD from distinctly French lyrical melodies to contemporary works making use of modern pedal and percussion techniques. An excellent addition to any harp CD collection. Bernard Andrès was born in Belfort in 1921. He received a teaching degree in music at the age of 21, studying both at the Besançon and Strasbourg conservatories. Subsequently, Andrès pursued brilliant harp studies at the Paris conservatory. In 1969, after a three year stint with «Musique de l’Air», he joined the Philharmonic Orchestra of Radio France as a soloist. Bernard Andrès began composing at the age of 8. Despite a sensible professional debut with an important national orchestra, the mysteries and challenges of composition continue to haunt him. The early compositions «Narthex» and «Parvis» would later enchant international audiences. In the works «Anamorphoses», «Acalèphes», and «Elegy to a Dead Shepherd», he fused fresh contemporary sound with magnificent atonal melodic tension. Bernard Andrès acknowledges few influences. He hopes to be recognized within the tradition of French music, one of great reserve and splendid poetry. Melody is Andrès’ chief concern. The fabulous emotional range of the human voice, which rends, rouses, and rejoices in the most divine expressions, is the fundamental inspiration of his compositions, whether they be classical or more contemporary. Andrès’ aim is to relate traditional music with contemporary concerns. He sees the evolution of music as an integration rather than an opposition of these two tendencies. The composer confesses that he does not like to linger in any given musical vein. So the listener will not be surprised by the diversity, and at times, seeming contradiction of the works here recorded. Let us enjoy and dream along to «Les Epices», «Duke», «Les Danses d’Automne», and «Les Préludes».